Having a little 3 month old baby around the house doesn't leave much time for complicated crochet projects... there is always something that needs to be done like changing a nappy or reading a story so you are constantly stopping and starting. So the best way to get a little crafting done in the short breaks between is to do something like this granny square blanket that I've started working on for my little bundle of trouble. I'm trying to use up a good few oddments of wool with this project and I've even had to borrow a few extra shades of blue as I keep forgetting just how much wool is needed to make a large crochet item. This blanket will be going on my son's new cot bed and as he is fast outgrowing his moses basket I'm going to have to be quick with it. The cot bed is pretty big (my little baby looks so small compared to it - I hope I don't lose him in there!) so I'm going to need another 70 squares... why do I always seem to be leaving my projects to the last minute? The friend who bought me this book must really know me very well as it is such fun. 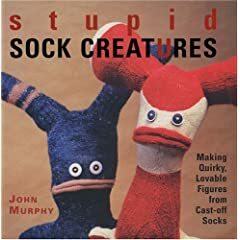 I love the idea of using my old socks to make these strange creatures - I've got a drawer full of socks that are full of holes but I just can't bear to throw away as I love the colours and patterns that they have. The instructions are clear and well written and the author encourages you to experiment and not worry about following an exact pattern. There is also an inspiration section at the back showing a whole host of other creatures made by the author - they are just so lovable! I'm really looking forward to having a go at making a creature or two myself now so hopefully the results of my own experiments will be making an appearance here soon. Amy Butler's book has been on my wishlist for sometime - I've seen it reviewed on a few other crafting blogs and was very keen to get a copy for myself. I'm so impressed with this book - the patterns are lovely, the projects are all beautifully photographed and the book itself is spiral bound to make using it much easier. My mother-in-law has an old spare sewing machine that she is going to be giving me in April so hopefully I'll be able to have a go at machine sewing for the first time. I'm pretty nervous - but determined to have a go as there are so many lovely things that I want to have a go at making.